CONCORD, N.C. — Kyle Busch is hoping his third career pole at Charlotte Motor Speedway will help end a dubious drought at a track that has frustrated him for years. Kevin Harvick is probably just anxious to get back on the track. Busch took the pole Thursday night for the Coca-Cola-Cola 600 on Sunday, while NASCAR Cup Series points leader Harvick will begin in the rear. Busch has never won a Cup points race in his previous 28 starts at Charlotte, although he did win an All-Star race here. 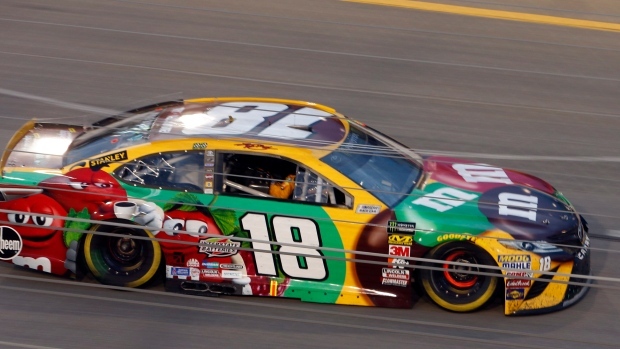 "We have had some really good runs here in the past, but we just haven't been able to close the deal," Busch said, referring to his 11 top-five finishes. Busch won his 30th career pole for NASCAR's longest race by turning a lap of 191.836 mph at Charlotte Motor Speedway. Joey Logano will start alongside Busch on the front row. But the big surprise was Harvick, who never got on the track after failing pre-race inspection three times. Car chief Robert Smith was ejected, and Harvick will have to sit out the first 30 minutes of practice Saturday. Harvick has been dominant this season, winning five Cup races — including the last two — and the $1 million exhibition All-Star race Saturday. Logano joked that with everyone chasing Harvick "it sure don't hurt" that he has to start at the back of the field. But he doesn't expect that to last for long. "Are we taking bets on how long it will take him to get up there," Logano said. "Where is the new betting thing? Is that what we're doing now." GIBBS CARS DOMINATE: Busch won't have to look too far back in his rear view mirror to find his Joe Gibbs Racing teammates. All four of Gibbs' Toyotas finished in the top 10 with Denny Hamlin qualifying third, Erik Jones fourth and Daniel Suarez 10th. Suarez looked strong again after finishing second in the All-Star race here Saturday night. "That was a tough one," Suarez said. "When you finish fourth, fifth, third, you know you get it. You go to the next one excited, but when you finish second, that close, it hurts a little bit. But that's part of racing. You have to learn from that and move to the next one." TRUEX STRUGGLES: Martin Truex Jr. failed to make the final round of qualifying and will start 15th, which is a bit of a surprise. Truex has two wins in the last four races at the track, including one of the most dominant performances in NASCAR history in leading 392 of the 400 laps to win the 2016 Coca-Cola 600. Truex has five top-five finishes in the last six races at Charlotte. Truex led a race best 233 laps in last year's 600 only to finish third in a fuel mileage race won the Austin Dillon. "No front tire grip," Truex said of his night. BUMPY ROAD: Logano called Charlotte Motor Speedway the bumpiest course that drivers face all year, saying it is "brutal" in the driver's seat. "It's like driving down a cobblestone road," Logano said. "It bounces your head around a lot." DILLON'S DAY: Austin Dillon won the last year's race on fuel mileage. He only led two laps all night. Dillon, who won the Daytona 500 earlier this year, will start 12th. Dillon said he thinks he has a top-5 car and can repeat. "Yeah, really pumped about the effort that we put in to these Coke 600 cars," Dillon said. "It paid off, obviously. ... At least we've got a direction and we will keep working hard to get there."